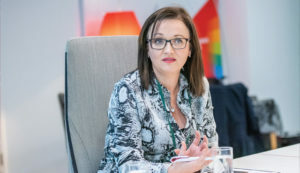 Vodafone’s Head of public sector Shelah McMahon hosted a round table discussion on the importance of mobile connectivity, cloud services and how important 5G technology will be for delivering their services across the public and private sectors. How has mobile connectivity enabled your organisation to work differently? Do you have any specific examples? It has allowed us to pilot different initiatives within the Digital Transformation Programme that we’re about to embark on. We have a very diverse range of services that we offer to our customers; everything from strategic planning and economic development for the county through to housing maintenance and road maintenance. We have a large volume of staff who work outdoors, and many travel around the county and conduct field surveys and similar work. Mobile technology has meant that we have been able to transform the way they work. Digital data will load back through the connected network back to head office and this drives efficiencies by releasing those staff to stay out and continue inspections. We have been able to dramatically increase the numbers of inspections. There are also savings in the back office in terms of cutting down time spent data logging. The diversity of our business means that some business units are mainly based in-house with limited requirement for mobility, while others operate in the field with significant mobile requirements. Advances in mobile technology has allowed us to enable this diversity and we currently have plans to provide a new, secure, device independent mobile platform for a significant number of our staff as we move to a new premises in Q3 of this year. We have undertaken a significant proof of concept with this new technology and hope that it will be a key enabler as part of our transformation to the new way of working envisaged for our new building. It will also provide a more functional and secure solution for remote and home working. 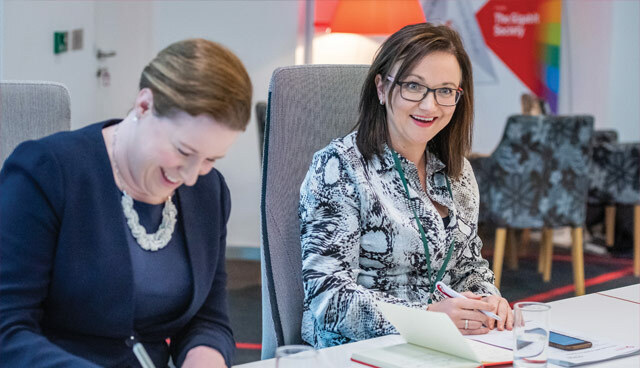 Mobile connectivity has transformed the way we work in Vodafone and enables us to collaborate with our customers across both the public sector and private sector to help them realise their connected ambition. Our people and our customers are located in sites throughout the country. We promote smart or remote and flexible working and it has facilitated improved collaboration, agility and innovation in both our workforce and how they deliver for our customers. It has also changed how our customers manage and deliver their services. There are many benefits of smart working, including attracting and retaining talent, increased productivity, promoting diversity and inclusion and a healthy work life balance. The Department is immense in terms of size and staff and we provide over a million transactions daily. It’s immensely important that the personal data we hold is safe; that’s our priority. What mobile enables us to do is to have our offices throughout the regions engaged and connected with centralised schemes in decentralised areas, effectively communicating in real time with our mobile solutions. The scale of the operation means that challenges are always emerging, and we always need to be connected and that’s evermore true given that our work is increasingly not located in one place. Connectivity enables us to work in a fluid way; the upside being we’re never away from the office, the downside being we’re never away from the office. Mobile connectivity allows our 1,600 staff all over Ireland to stay connected and collaborating. We also have services that we provide to the health service, like procurement, HBS Estates, finance, payroll, information that we need to make sure is always secure. The way the digital workplace is changing is a huge driver for us in the health service and how we enable our staff to grab hold of it is something that HBS is trying to build on very strongly. For example, in digital estates, and within our business relationship managers, we have people out on the road and for them to be able to access information and help customers as they’re there is massively important in building confidence with our customers and partners. We want to ensure we have the confidence and trust of those who we work with by having access to the required information at the right time. How have cloud services enabled the deployment of shared services? Do you have any other examples where public sector bodies are using cloud services? We provide a combination of Internal and External Cloud services in the NTMA. We recently migrated the National Incident Management System (a key system for the State Claims Agency) to a secure external cloud platform. Up to then it was entirely hosted and managed from within the NTMA’s internal secure data centre. The system was originally designed to provide an integrated incident and claims management solution for the HSE but has now been extended to a significant number of users across the Army, Gardaí, Prison Service and many other State entities. We provide it as a shared service offering through secure internet connectivity. One of its big advantages for government is the provision of a cost effective, centralised and standardised data entry, reporting and data analysis mechanism across multiple state agencies. Scalability as we look towards additional rollout of the platform was a key factor in the move to the cloud, as was the opportunity to take advantage of a more efficient upgrade cycle and early provision to the customer base of new business intelligence functionality. We also have an external cloud-based service provided as a key component of National Development Finance Agency operations. This service provides a collaborative platform to a significant number of internal and external users working on PPP-based infrastructural projects. A key consideration with such services is to select the best options in terms of security, performance, cost and privileged access management. The more you open up your applications for external access, the more you increase the threat profile and we have a low risk appetite. As a government department we have been engaging with central government on ‘build to share’ initiatives. The Office of the Government Chief Information Officer (OGCIO) has a remit, under the ICT strategy for the Irish Public Service, to build and design central applications for systems and processes that are common to departments. Cloud services are at the forefront of the digital transformations we are doing. In 2019, Health Business Services (HBS) will complete its second strategy (HBS Strategy 2016-2019) with a focus on digital transformation due to a recognised shortfall in this area during the first strategy. Over the last number of years HBS has been looking at how we can scale up some of our ongoing transformations and cloud services has enabled some of this to happen faster. One of those projects is the roll out of the National Integrated Staff Records and Payroll Programme, providing all 116,000 HSE staff with online access to expenses management and leave applications. In other areas we are cloud-hosting elements of certain projects, such as Claimsure, where the project management tool is hosted in the cloud with the vendor. We’re working to balance what works for us in HBS within the cloud for shared services and what does not. This involves education for our staff around the cloud’s potential and educating those people using it. We are always open to learning from others on what has and hasn’t worked for them in these areas. The local government sector has a long tradition of sharing best practice but the ability to centrally host those services has provided great opportunity to learn from each other and to standardise across local authorities. Recent years have seen large shared services programmes ongoing in the sector including a shared HR and payroll system, which facilitates a shared payroll system to the entire sector from a single central location. This model has been further adopted to the likes of the Library Management System, where local authorities competed to lead on a system that is now implemented in all council areas. It means that the whole library system is joined-up and facilitates the sharing of resources. The same has been done for the Building Control Management System enabling standardisation. Currently, we’re completing testing on online portal for voter registration to the supplementary registers prior to May’s local elections based on the public services card model. The system will be hosted in Dublin and will move away from form-based registration and move people across the country into an online environment for voter registration. In the NTMA we are keen to use and provide shared applications on a cost-effective basis. Cloud is a key enabler for such services, provided that the users of the services also have access to quality internet/broadband access. There are obvious cost-efficiency and standardised data harvesting and reporting/analysis advantages for government with this technology, provided that security considerations are also continually reviewed. The level of standardisation is important as well. To have the same set of standards across such a diversity of bodies, who previously had their own unique systems, is impressive. There is a large piece of work with facilitating the change management element but providing the infrastructure and architecture ensures that everyone has guidelines to follow the standard, even those hesitant to change can help. But it is vital to invest in change management tools to help and enable staff move forward in a unified approach to understand for e.g. why one standard approach was chosen over another. Security is important too. By using the same system we ensure that security updates are centrally applied and this goes for all process improvements. The other advantage for all councils to gain capacity to modernise through sharing which previously may not have been available to smaller local authorities. “Mobile technology has meant that we have been able to transform the way they work. Chief Information Officer (OGCIO) and many public bodies to build the Government Cloud Network (GCN). To date, we have connected 626 sites with another 140 in the pipeline. Delivering Gigabit connectivity across the public sector allows all agencies and bodies to avail of connectivity and services and to consume and share data, efficiently and securely, in a way that they never could before. We are now building applications to sit on this network such as Voice (GVN) and Guest internet access (G²IA) and delivering these to scale. Reference ability is key in government. Digital transformation is a journey, not a destination, and many public sector bodies are at different stages of that journey. Cloud Services such as GCN, GVN, Centralised and Guest Internet Access enables agencies to pursue digital transformation and the efficiencies and scale of it at their own pace allowing agencies to achieve significant economies of scale in accessing and delivering services. Technology is an enabler but having a reference point and peer-to-peer interaction is important to bring people along or to start their journey. The successes need to be communicated, something I think we are reluctant to do across government. We have some great examples of where we have used shared services and technology to deliver huge economies of scale for big efficiencies. I’m not sure there is a wider appreciation for some of the innovations that have taken place and we need to share those stories and learnings. 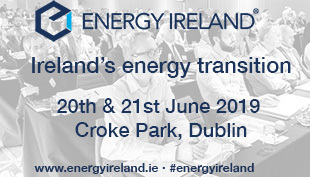 There has been a shift in the last couple of years towards provision of shared resources and the OGCIO, to their credit, have done a lot around moving towards the provision of common applications. It’s a significant shift and it’s a welcome one which the NTMA is keen to embrace. They have also provided an excellent service to state agencies over many years via their government networks team and the NTMA has been a big beneficiary of this service. Traditionally, we all hide our homework. 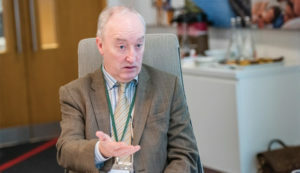 However, what we have discovered via connection to the OGCIO and to DPER is that there is a lot of central government and other agencies using similar HR modules to ourselves and as a result we now have a group being assembled nationally to share their experiences of shared services, highlighting the cost benefit of streamlining. Another element though is the benefit to the end customer. A good example is the ePlanning portal we are currently working on, interfacing all planning systems. This level of transparency provides huge benefits to the public at large. What factors do you take into account when deciding between public, private or hybrid cloud services, and how have security and GDPR issues impacted the use of mobile and cloud connectivity? Data classification and data sensitivity are key. We have a ‘cloud first’ strategy with an emphasis on private and hybrid services, but we are very wary of the use of public cloud services for confidential or sensitive data. In regard to cloud adoption, we refine our policy every two years or so and take particular note of the OGCIO’s guidelines in this regard. An example being that data classified as ‘secret’ would not be hosted on any external cloud infrastructure at this time. Cost is another factor and we are also mindful of the hidden costs inherent in external cloud platforms together with the emerging overhead of due diligence and more onerous audit considerations. In terms of GDPR, we like the concept of personal data minimisation and the provision of secure remote access through mobile cloud connectivity to remotely enabled applications. This is the environment we are moving towards with our new VDI infrastructure and, in this scenario, the data is held centrally within a secure data centre and never on the device itself. HBS uses a mixture of hybrid cloud services, assessing what best suits our systems and the sensitivity of the data. However, we also recognise the need to be agile to other types of cloud. Working with our partners to ensure that we are using the right cloud for the right systems. We too have a ‘cloud first’ policy within the HSE and we are trying to build upon that with innovation. That means as well as our large digital transformations within HBS we also need to have our eyes open to smaller innovations that if adopted can offer enhanced impact in a shorter period of time. Sensitivity is a large factor for us and something we are conscious of. For us, who have always been mindful of data protection, GDPR brought about a wider and stronger awareness for all our staff on our approach to what we were doing in that area. Brexit has been a factor in HBS, especially in the area of procurement and the team have spent time ensuring our data is hosted in the EU and that we are compliant in this area. We are ‘cloud first’ and recently announced a partnership with IBM to ensure all of our customers have a full cloud managed service offering. In my experience of the public sector the dial has definitely moved in the last four years from an ‘on premises’ mind-set to embracing cloud first. However, as with digital transformation, it is a journey. I do not think there is a one-size-fits-all approach even within one agency never mind across the public sector and an agency’s mixture of public/private/hybrid cloud will depend on their requirements, the application and the type of data. Security is a key driver for public sector embracing cloud – and I believe data classification is key – what data is held, what needs to be accessed and by what groups. We have shifted from that ultra-cautious position. Part of that is moving away from the mindset that any system being implemented has to be perfect at the beginning. Doing so opens up big opportunities in terms of the range of systems available to us that will do the job and which we can continually improve. Data security and the cost benefits are major factors taken into consideration, as too is the fact that our suppliers are telling us that they are only going to be offering cloud services in the future. I believe John’s point on a shifting mindset is completely correct and is driven by the requirement for agile, secure and efficient delivery at scale. The landscape is shifting and cost is as ever a huge consideration to the public sector. The requirements for public sector bodies is to do more with less, with no reduction in reliability or security. The advantage of cloud is the ability to consume as a service, with the cost-benefit of not having to build out infrastructure that may become dated or limited. However, it is not as simple as looking at the cost benefits on paper. It is a more cautious journey for the public sector. won’t have the connectivity to enable that model. That can cause frustrations, especially if staff think it’s a technology or systems problem and their motivation for embracing transformation can waiver. How do you see mobile and cloud services developing with 5G technology? Accessibility of mobile and cloud services across the state is not ubiquitous. We are keen to collaborate with government and state agencies to look at the country’s blackspots and evaluate what we can do with existing infrastructure across local authorities to build technical and funding proposals. Ireland has 42 per cent of its population living in rural dwellings compared to the European average of 20 per cent. Our geography and topography does not lend itself to investment by a single entity. We believe that collaboration between telecommunications operators, local authorities, government and relevant state agencies is essential to bring connectivity to areas previously deemed commercially unviable. Connectivity allowing us to have access to the right information at the right time is hugely important for us. We’re serving our partners, who are hospital groups and community health organisations, and we need to make sure that we can respond to them efficiently. ‘Mobile first’ is a big thing for us and it’s enabling us to be much more responsive. Currently we do a lot of our communications stories through digital magazines, videos and animations and 5G is going to make that much more personal and engaging. There is huge potential for our MyWelfare services, both in terms of improving access to them and for the services themselves to be enhanced. We are in the early stages of providing online service and it’s in good shape. You can now apply online for maternity benefit and make PPSN appointments. That process is built to be entirely mobile responsive. Around half of those accessing it are already doing it via mobile. So, if you lose your job, you can apply for Jobseekers’ Allowance online; if you get a new job, you can sign off online. 5G will support the nature of those services. It will be a huge enabler for us to enhance the experience of users. Connectivity is fundamental to all the services we partner to deliver to the citizen and it is fundamental to the citizen to access those services. I am as excited about the work we are doing on our network with 4G and 4G plus on the journey as the end state of 5G. It isn’t going to be an overnight switch and the work that we are doing on the network to make it 5G-enabled is already delivering faster speeds, improved throughput and increased capacity and availability. In the short and medium term, the devices you hold in your hand will be able to deliver gigabyte speeds. We are currently running 4 * 5G enabled fixed wireless home broadband trials in Roscommon, Gorey, Clonmel and Dungarvan on our dedicated 3.6Ghz Spectrum band. This trial will allow us to look at how we can enhance and extend broadband access to our customers in the most rural parts of the country. Public sector requirements around latency, throughput, reliability and mobility will be addressed with 5G and network slicing where we will be looking at splitting our network into multiple virtual networks, which will potentially support customised connectivity to support particular services such as blue light services. The work being done for the transition from 4G to 5G is further enhancing the mobile working opportunities for staff. 5G will enable higher performance for bandwidth hungry applications and it will help to remove barriers for those working on the move, particularly with the applications of the future. 5G should also significantly boost business continuity operations in the future and provide better opportunities for business development in the regions. Connectivity is critical for us from a staff perspective as, to deliver the modernisation we are aiming for, staff have to have the certainty and reliability that will build trust in the systems. In terms of customer demand, out of hours access to our website is 64 per cent by mobile. The capacity for us to use the high volume, high quality data that will be possible with 5G is huge and we are redesigning our website now to facilitate video and more data. This time last year (March 2018) we were buried in snow, we had two weeks of service outages and one of the success stories that Fingal had was our ability to communicate with the public via social media. We had staff out in crisis conditions who were reachable, 5G will make that all the easier. We have our Smart Cities Programmes where we’re installing connected devices, like 15 smart street benches with screens and charge points, we’ve installed a pilot of 20 solar-powered litter bins that tell us when they need to be emptied. There’s huge potential there in terms of these projects: traffic management, general transportation, energy efficiencies, environment and planning. Ken Jordan is a deputy director and head of ICT for the National Treasury Management Agency (NTMA), a role he has held for almost 20 years having worked prior for Qatar Petroleum, Bord na Móna, Digital Equipment International and the Irish Department of Energy. Ken is an ICT graduate of Trinity College Dublin at both Primary and Master’s degree levels and has studied IT Management and Business Finance at the Irish Management Institute. 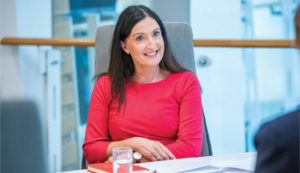 Shelah McMahon is head of public sector sales in Vodafone Ireland. 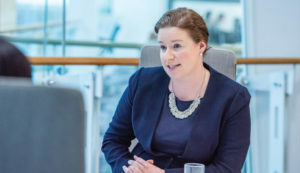 Shelah has worked in the the Public Sector team for three years managing the Central Government portfolio and previously led Public Sector Service Management for Vodafone Ireland. Shelah has 25 years of experience across financial services and telecommunications with extensive experience of leading large teams and Strategic Change Programmes. 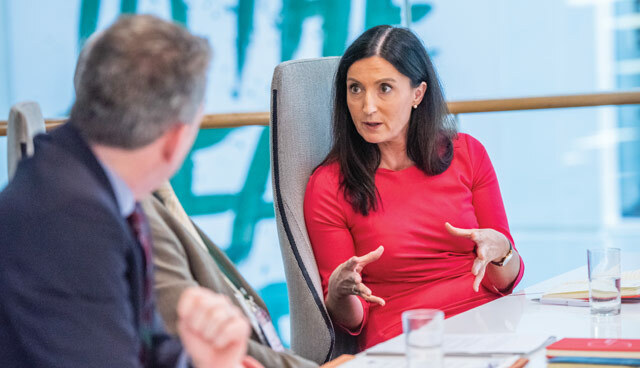 Shelah is passionate about connectivity and pioneering a gigabit society where public and private sector collaborate to democratise connectivity,which will deliver benefits to all citizens living and working in the island of Ireland. 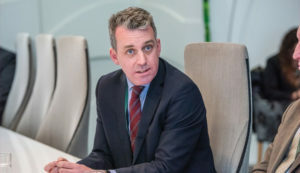 John Quinlivan has been director of services with Fingal County Council since 2015 where he holds the corporate affairs and governance brief including IT, HR, corporate services, governance, communications and internal audit. He has 25 years of experience with Dublin City, Wicklow, Meath and South Dublin County Councils. 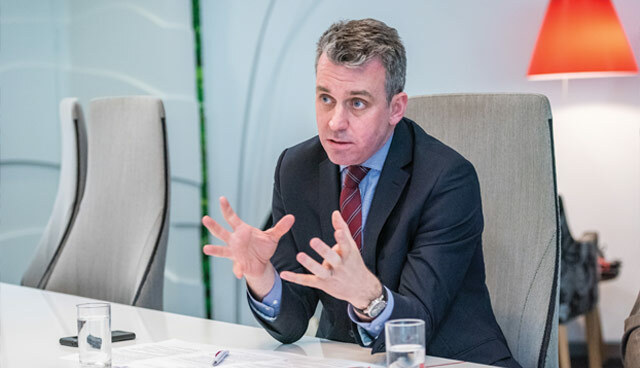 He also has extensive experience in leading strategic and operational change and in his current role provides strategic support in the delivery of services and driving the change agenda throughout the organisation. Maria O’Loughlin is an organisational psychologist and assistant national director for Organisational Digital Change in the HSE. She was nominated as Digital Leader of the Year for the Women in IT Awards 2018. Maria leads many of the innovation and start-up relationships in Health Business Services in the HSE. A passionate advocate on how technology can impact healthcare and its delivery, Maria is the co-founder of the One HealthTech Ireland Hub. She has an undergraduate degree in Psychology, an MSc in Computers and Information Systems and an MSc in Organisational Psychology. Sarah O’Callaghan joined the Department of Employment Affairs and Social Protection in 2016 as head of customer communications and customer service. She has over 15 years of strategy and communications experience and has led strategy development and implementation, strategic communications, change management and public affairs for several large private and public sector organisations. 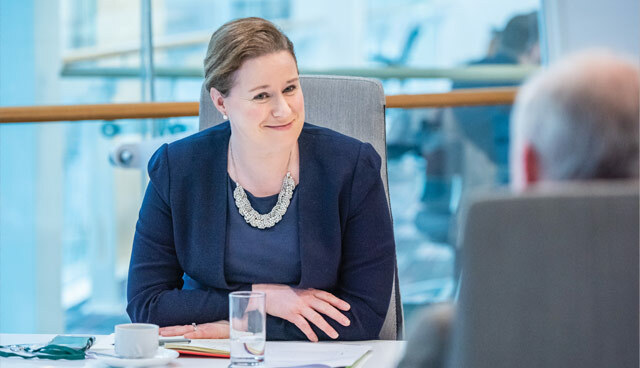 Prior to joining the Department, Sarah’s roles included media communications manager at Enterprise Ireland, and senior public affairs consultant with Murray.